Shopping for a new Tesla Model S? The low-end Model S with rear-wheel drive only is no longer offered, so if you want to save money on a Tesla, sign up for a reservation on the less-pricey Model 3—and prepare for a wait. The 2018 Tesla Model S still delivers unequaled battery-electric performance, though its style and safety are beginning to show their age. The 2018 Tesla Model S luxury sedan safely can be called a vehicle that history will remember. The all-electric Model S remains the fastest plug-in car in volume production, though those qualities come at a price. Tesla doesn’t have trim levels, but this year the Model S comes in essentially three versions, all now with all-wheel drive: the “75D” has a 75-kilowatt-hour battery pack, the “100D” has a 100-kwh pack, and the top-of-the-line “P100D” also has a 100-kwh pack but more powerful motors. It’s the hot rod of the group. Shoppers should know that Tesla’s model years simply correspond to production dates on the calendar, and it rolls out updates whenever they’re ready. That means model years mean relatively little: a 2017 Model S built in December is all but identical to a 2018 built in January, while a 2018 built this coming November or December may have numerous changes versus the January car. The other thing buyers should know is that five years after the first Supercharger site opened, Tesla remains the sole electric-car maker whose cars have access to highway fast-charging that largely blankets the lower 48 states and permits the car to add up to 200 miles of range in 30 or 40 minutes. All other 2018 electric cars that claim “fast charging” operate only at 50 kilowatts, against the Tesla’s 125- to 135-kw maximum. That makes cross-country trips in Teslas uneventful, if still slightly slower than powering straight through on gasoline. The Tesla Model S was a remarkable achievement from a startup California company few in the industry took seriously until they drove its first all-electric cars in 2012. 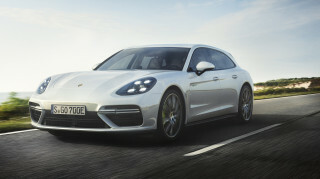 It scared the daylights out of German luxury makers, all of whom have competitors coming for 2019 or 2020. 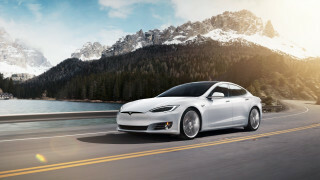 With more than 150,000 copies on the world’s roads, the Model S remains today an exemplar of what electric cars can be. It will still cost you as much as a high-end German sedan, but it does things no German luxury model today can do—namely, drive entirely free of tailpipe emissions. The 2018 Tesla Model S has changed little over six years; its shape still appears handsome, if not fresh. The 2018 Tesla Model S doesn’t look remotely as though it’s in its seventh model year, but it is. That’s a testament to the essential rightness of its low, sleek, fastback shape, which has received only a new nose and some changes to wheels since its 2012 launch. 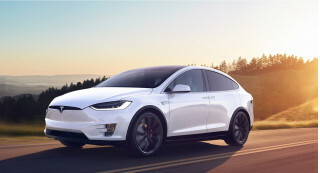 The 2016 redesign of the front end dispensed with the large black oval shape that stood in for a grille; a rounded flat panel with a slight lip at the top now leads off the front, matching the frontal design of the later Model X and Model 3. One of the most commented-on exterior features is the ability of the chrome door handles to extend for use when the driver nears the car, then retract flush to reduce drag once the car gets underway. While it’s widely viewed as a sedan, by the way, the Model S is actually a five-door hatchback, with a large rear tailgate that lifts high enough to let owner loads boxes, bicycles, and an unexpected quantity of goods. Inside, muted colors trim an unadorned space whose focal point is the huge 17-inch touchscreen that stands proud of the center of the dash. Soft-touch surfaces abound and leather seats are available, but few interior controls—knobs, dials, and levers—mar the elegant simplicity. Drivers and passengers have to get used to operating most of the car’s ancillary functions via swiping, sliders, and icons on the touchscreen, including such basics as audio, navigation, and cabin heating and cooling. The screens remain clear and crisp, with bright, colorful, high-resolution graphics. The 2018 Tesla Model S offers remarkable acceleration, excellent roadholding, and a smooth and quiet ride, powered as needed by the remarkable Supercharger network. With the sole remaining rear-wheel-drive version out of the lineup for 2018, the Tesla Model S range offers two battery capacities—75 or 100 kilowatt-hours—and standard or “P” performance versions, all with the “D” suffix that indicates all-wheel drive. The standard 75D and 100D versions of the Model S are powered by a pair of 193-kilowatt (259-horsepower) motors, one per axle. The higher-performance P100D swaps in a more powerful 375-kw (503-hp) rear motor, keeping the same front motor, along with some upgrades to its power electronics and various electronic control systems. Acceleration is swift, smooth, and quiet in all models, but the top P100D offers “Insane” or “Ludicrous” modes that will rocket the 5,000-pound car from 0 to 60 mph in less than 3 seconds if the battery is fully charged. That doesn’t do much for battery life, and it eats up range, but it’s addictive and one of the single best ways to sell the idea of electric cars. Just look for “Tesla P100D acceleration” videos online and you’ll see the shocked reactions of unsuspecting passengers. That model’s not cheap—it starts around $130,000—but its acceleration can’t otherwise be found in anything short of a supercar. 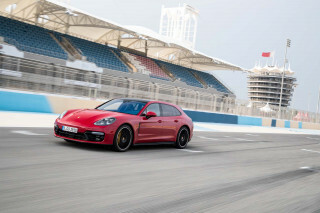 Even in the lesser models, the maximum electric torque available from 0 rpm provides swift victory in stoplight drag races. The all-but-silent powertrain and lack of wind noise make it far too easy to exceed 60 mph even on city streets. Despite its all-aluminum construction, the Tesla is a heavy car, but its battery weight is as low in the chassis as it can be, and it corners flat and confidently. 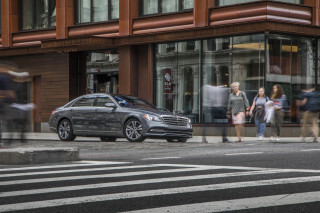 The optional air suspension copes well with more types of surfaces and road conditions than the conventional steel fittings on the most basic version—and boost the ride from firm and controlled to above average. 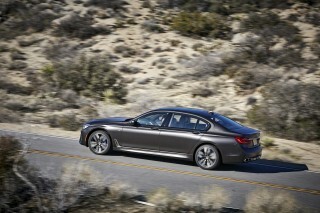 Drivers can adjust the suspension firmness of the air suspension either to be firmer than the standard default or to a comfort mode that might more accurately be termed “mushy.” Drivers can also choose standard or more aggressive regenerative braking, though it’s still nowhere close to BMW’s one-pedal driving, and whether to add idle creep at stops or eliminate it altogether. The 2018 Tesla Model S remains a comfortable way for four adults to travel, with excellent seats and a smooth, quiet ride. Just as it did when launched, the 2018 Tesla Model S seats four adults comfortably, and five in a pinch. The front accommodations in the Model S offer no serious caveats. There’s no tunnel between the seats, though Tesla’s effort at providing a conventional storage console isn’t up to the rest of the cabin. The rear seats have decent space, but it can take a bit of effort to get to them. The rear door openings are somewhat smaller than the actual doors, requiring taller adults to do some minor folding and ducking to get in. 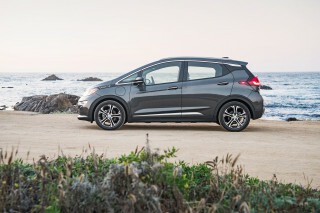 Even with the optional sunroof, headroom is adequate, though rear-seat riders will note the cabin narrows starting at shoulder height to cut cross-sectional area for reduced aerodynamic drag. Riders will also notice the lack of conventional footwells, since the battery pack sits under the flat cabin floor. 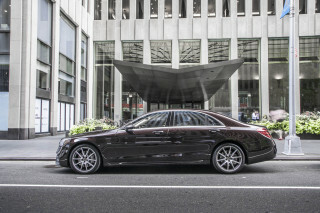 The resulting “legs out” position differs from that of a regular luxury sedan, and the rear seat back is reclined at more of an angle than usual to provide headroom—but once riders accommodate to the proportions, they’ll find themselves quite comfortable. For those reasons, we nearly deducted a point for the Model S’ rear seats. The Model S offers a pair of rear-facing jump seats that take up most of the cargo hold but will hold two small children as well. We have serious concerns that the rear-facing seats put children too close to the rear glass and leave them less well-protected than in other seating positions. The interior ambience is one area where other luxury makes, Mercedes in particular, have stepped up their game since 2012, and the Model S has lost some of its “shock and awe” for a wee bit of, “Is that all there is?” Passengers will still reveal in the car’s full web browsing via its built-in internet connection, though. The relatively plain dashboard is dominated by the 17-inch touchscreen in the center, which controls most cabin and vehicle functions beyond those the driver can access with stalks and steering-wheel buttons. The screen is bright and crisp, the icons are large and crisp, and response is fast, meaning once drivers learn how to use the screen, the time spent looking away from the road is lessened. On the road, the Model S remains calm, smooth, and quiet. A touch of whine from electronic components filters through every now and then, but otherwise, careful attention to aerodynamics cuts wind noise and lots of insulation keeps the cabin mostly hushed and underscores the quiet appeal of battery-electric power. The 2018 Tesla Model S earns good crash-safety ratings; its Autopilot system now requires drivers to pay far more attention than it used to. The Tesla Model S had superb safety ratings when it was tested soon after its launch, but its ratings have fallen as agencies have made their tests more difficult. The IIHS gives the Tesla its top rating of "Good" on all tests except the driver’s side small-overlap front crash test, where it dropped one level to "Acceptable." The institute hasn’t performed that test on a Model S for the passenger side. Its crash avoidance and mitigation measures are rated "Superior," and the only sour notes is the headlights: the IIHS rated them as "Poor," its lowest rating. As noted, the Model S gets five stars overall and across the board from the NHTSA, just as it has since 2013. A rearview camera is standard on the Model S, as are eight airbags. Its active-safety features include automatic emergency braking, active lane control, blind-spot monitors, and limited ability to drive itself in some circumstances on well-marked roads for miles at a time via the optional “Autopilot” system. That system is far from the fully autonomous driving its name might indicate, but its ability to provide Level 2 autonomy on well-marked roads is as advanced as any other maker’s offering in the field. The 2018 Tesla Model S doesn’t drip with luxury features, but it offers some unique items (and the promise of self-driving on, theoretically). The lineup of 2018 Tesla Model S electric cars has moved slightly up the price ladder to leave room for the company’s new and smaller Model 3 sedan. While Tesla doesn’t offer conventional trim levels, this year the three versions all come standard with all-wheel drive. The “75D” is fitted with a 75-kilowatt-hour battery pack, the “100D” goes up to a 100-kwh pack, and the high-end hot-rod “P100D” adds considerably more power to the 100-kwh pack. Prices start around $75,000 and run to $135,000 or more. 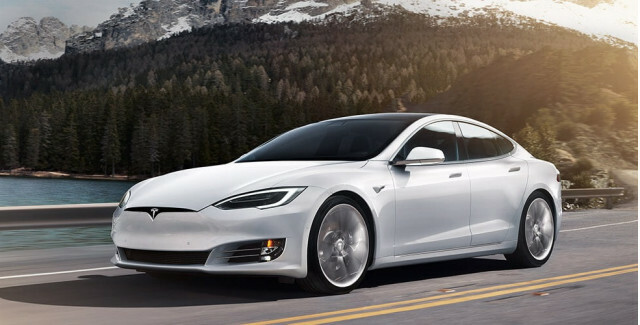 The 2018 Model S comes standard with most of the expected luxury features, including 12-way power-adjustable front seats with memory (including mirror position), keyless ignition, one-touch power windows, wi-fi connectivity, LED ambient interior lighting, power folding door mirrors with memory that also self-dim (as does the rearview mirror), and Bluetooth pairing. A pair of dark tinted glass panels that replace the metal roof, previously optional, are now standard on all Model S versions, as is power assist for the liftgate. A steel coil suspension is fitted to the 75D model, but an air suspension is no longer available on that car. It’s standard on both versions of the 100D, however. The giant central touchscreen, with its large, crisp icons and fast response, is still the largest we know of in any vehicle, though the twin 12-inch digital displays that make up the latest Mercedes-Benz dashboard—paired with an array of more conventional knobs, dials, and switches—comes closer than any other car in impressiveness. Options can add up quickly on the Model S. The pair of rear-facing jump seats for small kids runs $4,000. A $5,000 Premium Upgrades package bundles together a premium audio system with 11 speakers; XM satellite radio if the glass roof is ordered; a group of cold-weather features—heated seats for every passenger, heated steering wheel, wiper blade defrosters, and heaters for the washer nozzles—and not only a pair of charcoal cabin-air filter but even a HEPA filter. On top of that, the Enhanced Autopilot system is another $5,000; Tesla says carefully that “features will continue to be introduced as validation is completed, subject to regulatory approval.” The current version includes adaptive cruise control, active lane control, lane changes after a turn is signaled, self-parking in selected spots, and a “summon” feature that will bring the car to the driver. The version fitted to early 2018 cars is only now getting features equal to those offered by an earlier Autopilot version built into cars until September 2016. Under the watchful eye of the NHTSA, Tesla has proceeded more cautiously with Autopilot of late. It added reminders and alerts to ensure drivers are attentive and capable of retaking control after a handful of highly publicized crashes by Teslas running on Autopilot. Note that Autopilot remains far from offering actual autonomous driving in a majority of circumstances. Still, the current iteration of Autopilot is as advanced as any Level 2 system fitted to any other production vehicle today. Tesla claims it will offer something called “Full Self-Driving Capability” for a further $3,000, a function to be rolled out at some unspecified time in the future, “dependent on extensive software validation and regulatory approval, which may vary by jurisdiction.” If you decide you want it switched on after you bought the car, it’ll be $4,000. Other options on various models include leather upholstery and a power-operated shade inside the rear hatch. Wheel designs include the standard 19-inch “Aero” wheels—which give the lowest drag, and hence the highest range—and both 19- and 21-inch “Cyclone” turbine-like designs. The 75D model comes only with the 48-amp onboard charger, while the 100D and P100D versions have the High Amperage Charger, rated at 72 amps, as standard. Supercharging fast-charging capability is standard, but Tesla no longer offers free unlimited use of the nationwide Supercharging network to new buyers, though some exceptions exist. The Model S uses a unique Tesla connector rather than the standard J-1772 fitting found on all other electric cars and all 240-volt public charging stations. It comes with an adapter cable to let Teslas to use those stations. The Supercharger network, operating at 120 kilowatts and sometimes higher, will recharge a Model S battery to 80 percent of capacity in 20 to 40 minutes. Each Model S comes with a 4-year, 50,000-mile limited vehicle warranty. The battery pack and drive unit carry an 8-year/unlimited miles warranty. The 2018 Tesla Model S is one of the longest-range electric cars on the market, and it’s energy-efficient for such a large vehicle as well. The three versions of the Model S this year offer EPA-rated ranges of 259 to 335 miles, though experienced drivers will tell you to cut 20 percent or so off those numbers if you do 75 mph on the highway. Winter temperatures also cut a similar amount from the range, though data shows only a tiny percentage of U.S. drivers cover even 100 miles a day, so any Model S offers plenty of margin for daily and weekend driving. The energy efficiency of the Model S versions varies only slightly, from 98 to 103 MPGe. Miles Per Gallon Equivalent, or MPGe, measures how far a vehicle can travel electrically on the amount of energy contained in 1 gallon of gasoline. While the Model S is roughly one-quarter lower than the highest MPGe ratings this year—the Hyundai Ioniq Electric comes in at 136 MPGe—it’s a larger, much faster, and likely more desirable vehicle with double the range of the compact Hyundai hatchback. Like most electric cars, Teslas cost one-third to one-fifth as much per mile to run as comparable models powered by gasoline engines. 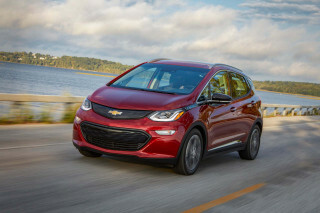 The numbers vary a lot, because U.S. electricity prices vary by almost a factor of 10, but the money saved is a nice extra even if the car starts around $75,000. The Tesla Supercharger network of fast-charging sites along highways and heavily traveled trunk roads may be the car’s killer app. Road trips can be made in segments of roughly 200 miles, interspersed with charging stops that recharge the battery to about 80 percent of capacity (or 200 miles) in 20 to 40 minutes. The car’s navigation system will calculate not only where drivers should stop, but how long they should charge to minimize wasted time. Tesla laid out the template for a pervasive, effective, hassle-free fast-charging network five years ago, and no other maker has yet duplicated it. Still in love with my Tesla. I look for reasons to drive it. Still stops people in their tracks. Even people who never heard of Tesla will stop and tell me what a beautiful car it is. The features it has is minimum compared to Audi, BMW or Mercedes. You can see that this car was state of the art a few years ago when it came on the market but nower days it's far behind. Lets talk about a... The features it has is minimum compared to Audi, BMW or Mercedes. You can see that this car was state of the art a few years ago when it came on the market but nower days it's far behind. The best car I have ever owned. It's fun to drive. I am looking for improvements in distance between charges.